Its actually odd why people (like me) enjoy the pain of eating it. I have to admit, hot sauce bottles should be labelled with “Warning: Could be deadly” . However, I still like them. 🙂 Maybe its the thrill of doing it? I guess I just like challenging my mind and my body as well. 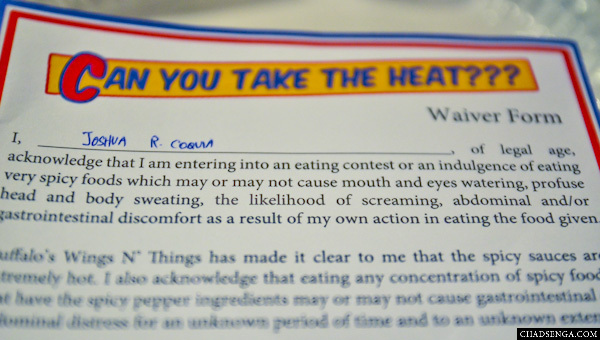 The level of spiciness of a food can be measured through its SHU or Scoville Heat Unit. So what is SHU? According to my internet research.. 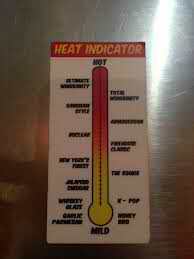 The Scoville scale is a measure of the “hotness” of a chili pepper. These fruits of the Capsicum genus contain capsaicin, a chemical compound which stimulates thermoreceptor nerve endings in the skin, especially the mucus membranes, and the number of Scoville Heat Units (SHU) indicates the amount of capsaicin present. Many hot sauces use their Scoville rating in advertising as a selling point. The scale is named after its creator, chemist Wilbur Scoville. So a month ago, I was challenged by my cousin to try this restaurant which offers the most spicy chicken in the planet (ok, so i’m exaggerating, haha!). The restaurant is called.. This is a local restaurant business operating in Manila, Philippines. Upon seeing the menu, I was offered to try their “ULTIMATE WINGSANITY”. 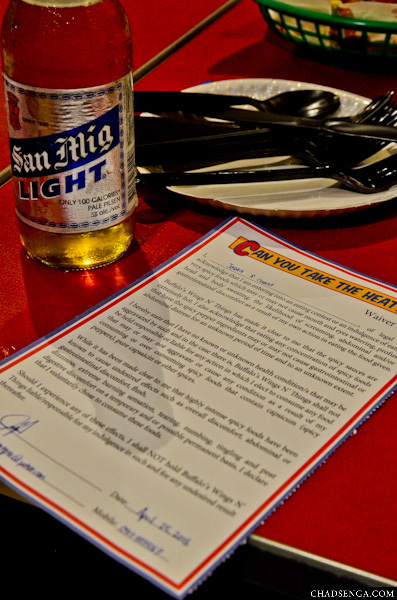 They say its too spicy so you’ll be required to sign a WAIVER upon ordering. So this obviously isn’t my waiver, I might’ve accidentally deleted it in my phone, the photos above are courtesy of google, haha but anyway, this is how the waiver looks like. To give you an idea on what I have digested, here are world’s spiciest chilies measured according to its SHU (Scoville Heat Unit). 7. Jalapeno Chilli – This is one of the most popular chilli in central America and some parts of north America. Jalapeno is used the large number of preparations including sauces, dipping and various main course cuisines. These chillies produce so much burning sensation that cultivators used rubber/plastic gloves while harvesting the crop. Scoville scale is 2,500 – 8,000. 6. Tabasco Chilli – This chilli is very popular in select parts of the world. Guess for what? It’s used to make Tabasco sauce and peppered vinegar. Tabasco peppers are gown in large quantity in central and south America to fulfill the huge demand of Tabasco sauce. Scoville scale is 30,000 to 50,000. 5. Piri Piri Chilli – This chilli is also known as – ‘African Red Devil’. As the name suggests, this chilli originated in Africa and is extremely hot. These chillies grow both in wild and in domestic & commercial lands. The name ‘Piri piri’ came from Portuguese language which is used to identify this African devil. 4. Habanero Chilli – This is yet another intensely spicy chilli. Habanero originated in Cuba and is grown in different parts of Cuba, Mexico, Costa Rica and Panama. This chilli is consumed in large quantity in Latin American society in the form of puree or salsa. 3. Red Savina Chilli – This short conical chilli is extremely spicy and was the hottest chilli till 2006 when Naga Jolokia displaced it from the throne. Frank Garcia of California cultivated this chilli. How he did this is still a mystery as he has not shared his methods for cultivating this chilli. 2. Naga Jolokia Chilli – It’s the spiciest chilli among non-hybrid peppers. This chilli originated in Assam and Nagaland region of eastern part of India. It’s so spicy that defence research department of India plans to use it as a potent weapon against enemies. Some tribes of east India also use it to keep off wild elephants from their crops. A single Naga jolokia can be used to spice up a preparation of at least 200 people. 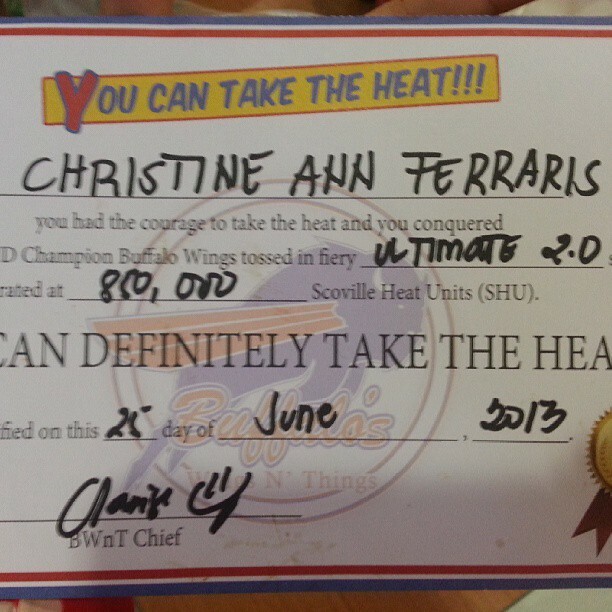 Their Ultimate WIngsanity’s Scoville Heat Unit is 850,000 (SHU). If I have known the info above before, I woudn’t have tried it. hahaha! 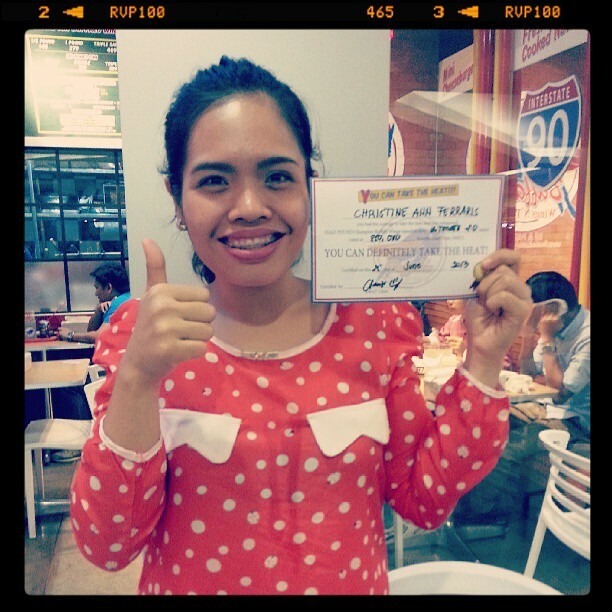 Here’s my a photo of me with my certificate. The challenge was to finish it in 5 minutes, no water. But I was able to finish it at 2 mins 46 secs (Tap on the back) hahahahah! Truth is, at first bite, it seems bearable. But then its builds up after a while. I drank water after but it just made everything spread even more, they don’t have milk as well so I tried to calm myself and not think of what I feel in my tongue. Mind over matter always works! The worst thing that happened? Well, there were tingling in my fingers and I was up all night as I feel something weird in my stomach. I feel the effects of capsaicin building up inside me. It was weird, really. I was actually expecting something worse but thank God I did not end up in the hospital. Hahaha! Would I try it again, you ask? DEFINITELY! Hope you enjoy this post! Stay happy and healthy everyone!